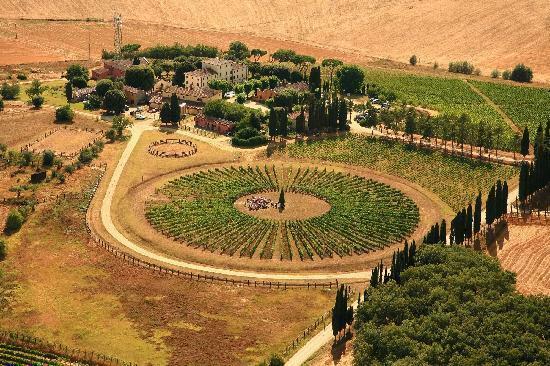 "The winery is named after the Avignonesi family, the founders of the original estate. We believe that the life force of the earth and the uniqueness of our terroir are at the heart of our brand. Avignonesi is reborn from the soil of our vineyards with each vintage in wines that mirror the subtle flavours of the site and the special traits of each year. Our wines express the richness and beauty of the Montepulciano territory. We respect the heritage of Montepulciano, where Sangiovese wines have been produced for centuries, and we wish to contribute to its future by being the finest representative of its heritage that we can be. We respect the innate character of each wine and seek to follow its natural evolutionary path from the soil to the cellar and - finally - to the bottle." Wine Spectator 90"Youthful, with exuberant black cherry, blackberry, chocolate and spice notes, this red is backed by a stiff, tannic spine. Needs time to integrate. Cabernet Sauvignon and Sangiovese." Wine Spectator 95 TOP 100 2008"Exhibits notes of chocolate-covered cherry, with raspberry jam and hints of coffee bean and vanilla bean. Full-bodied, with polished tannins and a long, rich finish. An exotic and exciting Tuscan red. Best after 2010. 2,000 cases made." Wine Spectator 90 (Top 100 2006)"A rich, round red, with lots of jammy berry and strawberry character. Full, round and caressing. Lots going on. Needs time. Best after 2007. 16,600 cases made. –JS"
Robert Parker 89 "The 2005 Cortona Merlot Desiderio is a plump, juicy wine loaded with sweet dark fruit, plums, chocolate and toasted oak. This supple wine possesses excellent up-front weight, but the intensity trails off a little on the mid-palate. It, too, should drink well relatively early. Winery NotesIntense ruby red in colour with a bouquet reminiscent of wild fruits, spices and grass; the taste is round and harmonious.